This adorable sitting Talavera reindeer (in an assortment of colors and designs) makes a great addition to your southwest Christmas décor. Our Talavera reindeer statues are all hand made and handpainted in Mexico. 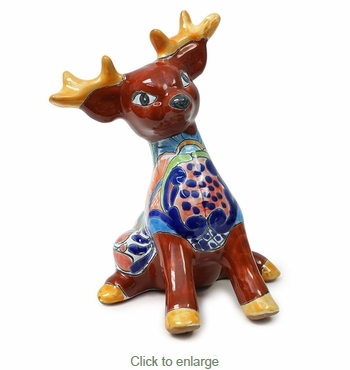 Our Talavera reindeer are also available in standing or laying down postitions, see below. Traditional Assortment: Expect variations in color and designs with these one-of-a-kind hand crafted reindeer. The reindeer you receive may have a different color and pattern from the image shown.